Now this is a fussy dish, but perhaps the most rewarding a Greek kitchen has to offer. Yemista means stuffed, a very matter of fact name for vegetables filled in with rice and herbs. In the old days people used to prepare a huge tray at home and sent it to the bakers for cooking. Especially during the summer where you’d spent the holidays at the country-side, in a tiny village with very few creature-comforts, let alone a huge oven. They would make it so early, I remember waking up to the smell as the baked dish arrived back from the bakers. The recipe below comes from Smyrna like my grandma Ntina. There are many variations of this dish across Greece, some add minced meat, others snub the nuts and raisins as they find it too sweet. The following is my personal preference but feel free to omit and adjust ingredients to your liking. You don’t need all the veg but don’t forget the courgette, even if you don’t feel like stuffing it, do grate it and use it in the stuffing. Hollow your vegetables and keep their flesh. This might take a while so allow yourself some time. Finely chop and fry the onion lightly, 3-4 minutes should do the trick. 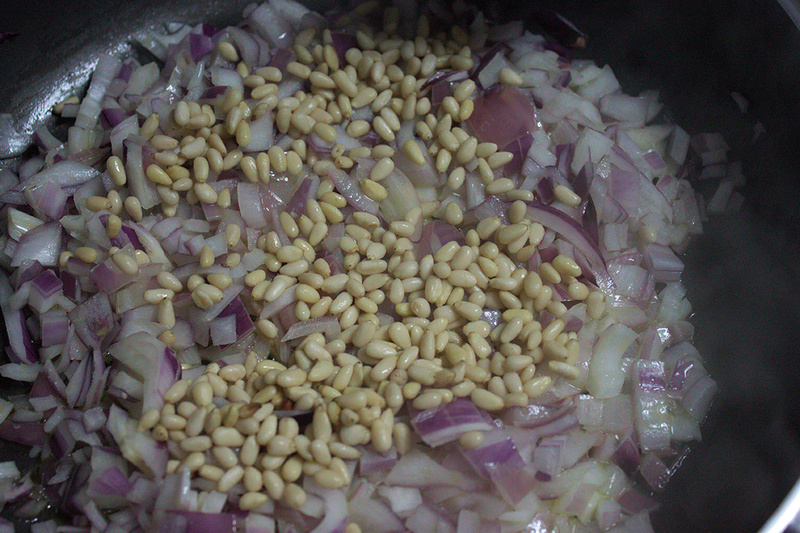 Then add your pine nuts and brown them. Now you are ready to add the vegetable flesh, aubergine and courgette. 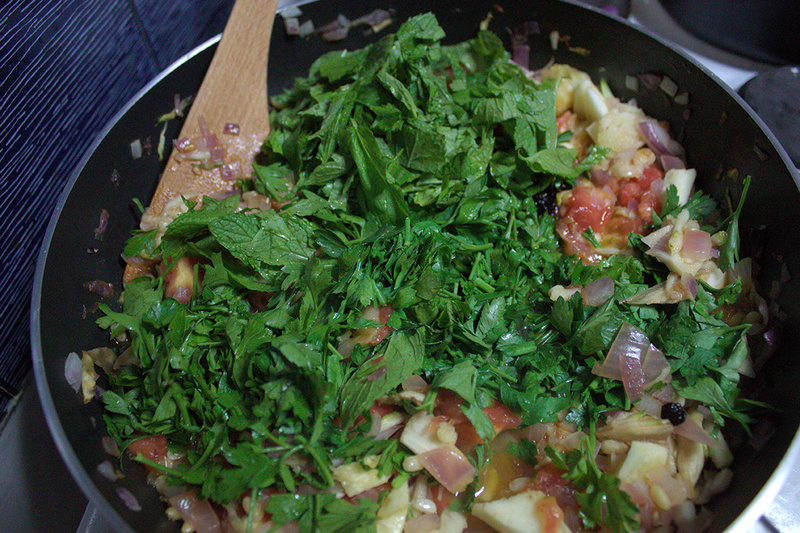 Stir thoroughly and then add 35gr of tomato paste, plus the tomato juice from the ones you have hollowed. 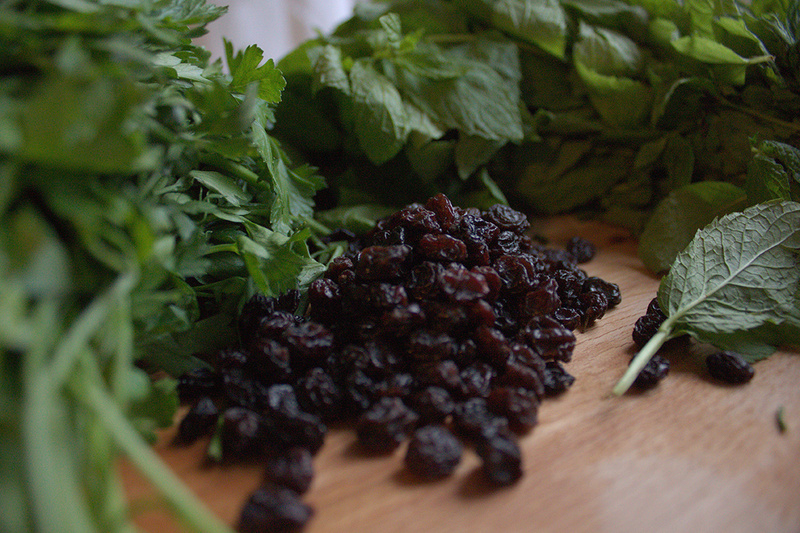 Stir nicely and add the parsley, mint, raisins, salt and pepper. Let it cook for around 10 min, then add the rice and cook for an extra 5min. So, get a nice spoon and start stuffing. Don’t over fill because the rice tends to expand. Place the little hats on your veg, pour 250 gr of tomato juice & passata, a bit of sugar, salt, pepper and the rest of your olive oil, and add a little water too. It needs approximately an hour in the oven at 200oC or 180 oC if it is fan-assisted. It’s been hard work, so you can now sit back and enjoy!